Right now, Jews are in the middle of the holiest days on their calendar. 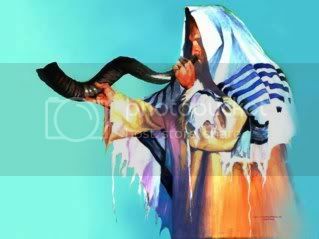 Rosh Hashannah, the Jewish New Year and Feast of Trumpets, began the High Holy Days last Friday evening. They will end this coming Tuesday evening with the conclusion of Yom Kippur, the Day of Atonement. Join me over at Exemplify today, where I provide a bit more background on this time of the year, also called The Days of Awe. Since I've become a believer these Holy Days always give me much to ponder--and be thankful for. Hope to see you there! One of my favorite parts of these days are the ritualistic blowing of the ram's horn, or shofar. It's quite a difficult thing to do (just ask anyone who's tried! ), but the sound is SO worth listening to. If you scroll down one post, I have a youtube video of someone blowing one in my post from yesterday.